Just what is body imbalance, and how do I know if it has happened to me? Body imbalance occurs when the C1 or atlas and/or the C2 or axis, the top two vertebra in the neck, are misaligned and out of their proper position. This can occur as the result of an accident, emotional trauma, or chemical toxicity in the body. Even childbirth can move the atlas out of position because of the massive amounts of pressure on the head and neck of the baby as it passes down the birth canal. Births such as those via vacuum extraction, forceps or C-section can cause damage to the delicate neck of a new born. Childhood accidents, such as falling from a tree, off a bike, or a roller-skating fall can also misalign the atlas. In adulthood, the atlas can be shoved out of position during minor or major accidents including sporting accidents, automobile accidents, and slips or falls. Some of the worst cases of atlas misalignment and resulting pain have been caused by minor car accidents, such as being rear-ended. One indication of having body imbalance is having one leg slightly shorter than the other. You may also notice that when you stand in front of a mirror, one shoulder is slightly higher than the other and one hip is higher than the other. Another indication that your atlas may be out of position is that you experience symptoms in your body that your medical doctor cannot explain, nor identify through medical testing. The C1 or atlas is a donut-shaped bone that your skull rests upon. Your spinal cord coming out of your brain and brain stem passes through the center of the donut shape. Your spinal cord at that point consists of trillions of nerve fibers (the nervous system) which “bottle neck” through the small opening in the atlas. These fibers eventually branch off, carrying information to every part of your body. If the C1 is out of its proper position, it can irritate, constrict, or disrupt vital nerve signals to any portion of your body. This can cause muscle or joint pain, organ dysfunction, lowered immune system, and countless other conditions that you would not ordinarily relate to a problem originating in your neck. Why is this called body imbalance rather than neck imbalance? This is called body imbalance because it affects the entire spine and body. Wherever your atlas moves, your head moves with it. If this top bone in your neck has shifted out of position ever so slightly, even no more than the thickness of a fingernail, it can move your head off-center of your body. In an effort to keep the head over the center of the neck, the entire spine and pelvis will twist, pulling one hip up and one leg with it. You are now walking around with one leg shorter than the other. This places more weight on one side of your body than the other. The wear and tear on your entire body is exactly like driving a car that is out of alignment. The result can be muscle and joint pain anywhere in the body. Without correcting the problem, which originated when a single bone at the top of your neck – the atlas – moved out of position, your entire body is now imbalanced. When this remains uncorrected over time, something else starts to happen. Because nerve flow is disrupted or distorted, degeneration of cells in organs can occur, causing internal physical problems which may not show up for years! Fortunately, no. The Upper Cervical correction can be described as a series of light hand presses applied to the side of the neck just below the ear lobe. That’s where the atlas is located. Sometimes, this is accompanied by an audible pop or a series of tiny ticks as the bone moves back into place. There is no twisting or torquing of the neck! This correction is engineered to reposition the weight of the head (10 to 14 pounds for the average adult) over the center of the body in order to restore body balance and restore brain-to-body communication. When the correction is made, muscles begin to relax, blood and oxygen circulation is increased, the brain is able to communicate with the affected area, and the body’s natural healing process begins. The healing process continues as long as body balance is maintained and the brain can communicate with all parts of the body. That depends on your own body. Some people can hold their correction for several months, even a year at a time. Others need to be corrected once or twice a week in the beginning, then once or twice a month. Everyone is different. The Upper Cervical/NUCCA doctor’s objective is to make as precise an Upper Cervical/NUCCA correction as possible. Then your doctor must help you maintain the correction with as few adjustments as possible so that you may live pain free and enjoy a better quality of life. Periodic Upper Cervical/NUCCA checkups, just like dental checkups and physicals, should be a part of your personal preventive health care program. If you are maintaining your correction and body balance, then your Upper Cervical/NUCCA chiropractor will not adjust you. I am concerned about radiation from the x-rays. Are they really necessary? 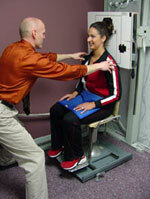 The doctor relies on x-rays to determine the exact position your atlas/axis vertebrae have misaligned. Yes. X-rays are the cornerstone of the Upper Cervical/NUCCA doctor’s practice and are very specialized. 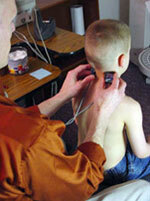 Most chiropractic equipment today, along with lead aprons, keeps radiation down to a minimum. In addition, any minimal danger from radiation, in our opinion, cannot be compared to the destruction that is going on in your body every minute that your atlas obstructs brain-to-body communication. Any shift the atlas makes can cause multiple health problems, even though that shift in position is sometimes no greater than the thickness of a fingernail. The Upper Cervical/NUCCA doctor must rely on x-rays to determine the exact position your atlas/axis vertebrae have misaligned. The specific analysis of the x-rays will allow your doctor to know how to reposition your atlas to within a fraction of an inch of the correct position it should be. The UC doctor will make the correction only after an intensive analysis of how far out of position your atlas has shifted. After correcting the atlas, either a second set of x-rays will be taken or a post heat reading is used to determine if the adjustment was done correctly. These are referred to as pre and post x-rays and pre and post heat readings. The doctor will show you these “before and after” x-rays and/or heat readings so that you can see the difference the correction has made. As soon after birth as possible! Then have them checked periodically as they grow up. You could not possibly give your child a better gift than to make certain that the one organ of the body that controls all other organs and body functions – the brainstem – is doing its job without interference from the tiny bone just below it. A fraction of what you have probably already spent in your quest to get well! We work for God, not for money, so we’ve structured our fees to be affordable for people to get the care they need. There will be some expense at the beginning because of the x-rays that are so necessary. But we will provide some type of payment plan which will enable you and your family to get under care as soon as possible. Because insurance does not distinguish between one form of chiropractic care and another, if you have insurance that covers chiropractic, it should cover Upper Cervical/NUCCA care as well. Unfortunately, some HMOs and PPOs only have certain chiropractors on their list of approved providers and they require you to go to them. Most of these, though equally well trained in other chiropractic procedures, may not be trained in precision Upper Cervical/NUCCA chiropractic. If the Upper Cervical/NUCCA procedure is so good, why haven’t I heard about it before? There are specific reasons why you have not heard about this before. Unfortunately, they are political. First, everyone is aware of the war that has been going on between the medical and chiropractic professions over the last 100 years. Whenever there’s a war, there’s always a blackout of information to the public at large. For example, a few years ago when we tried to discuss Upper Cervical/NUCCA care with any medical doctor or nurse, the moment we mentioned the word “chiropractor” a thick wall went up. We were never given the chance to describe how advanced chiropractic at large has become, and there are phenomenal procedures like this one available to people today. The medical prejudice we encountered prevented us from being able to share this information with doctors and nurses who work with people that desperately needed this information. This very information would have helped their patients avoid surgery in many cases and avoid the consumption of drugs with dangerous side effects. Because the doctors and nurses themselves did not know about this type of health care – and in some cases, they chose not to know, their patients have paid a high price for their medical doctor’s ignorance. Fortunately today, increasing numbers of medical doctors are discovering the benefits of Upper Cervical/NUCCA health care and are referring more of their patients to Upper Cervical/NUCCA doctors. These medical doctors acknowledge that constantly prescribing medication is ineffective and is actually creating additional problems. They realize that they have found a safe and scientific alternative that is of extreme benefit to their patients. Some of these progressive medical doctors are now becoming some of our greatest allies. One day, we sincerely hope that the medical and chiropractic professions will work side by side for the benefit of public health. We need them both. Another reason you may have not heard about Upper Cervical/NUCCA care is that certain laws in every state and in Canada prevent chiropractors of any particular procedure, whether UC or otherwise, from freely advertising the procedure they have dedicated their lives to learning. One law in particular forbids any chiropractor of any procedure to imply that his method is superior or more advanced than other chiropractic methods. If a chiropractor does this, he could be severely chastised by his state board of chiropractic examiners by being heavily fined and/or threatened with the loss of his license. It is possible that this law was originally passed to protect the public from chiropractors making unrealistic claims about their procedure. The unfortunate result of this law is that it has produced such fear among chiropractors who practice almost exclusively a specific type of chiropractic care, that they simply are forced to remain silent about the benefits of their procedure. A law meant to protect the public actually created a moratorium on vital information that could be of tremendous benefit and cost savings to the public. Give our Springboro chiropractic office a call to schedule an appointment today!